The award-winning home in Edinburgh (Image courtesy of Solar Kingdom). An Edinburgh home has won a prestigious award for the range of different energy saving and renewable energy generation technologies in the house. The award-winning concept was developed by architect Rob Goodburn who set out to create a zero-carbon, green property. He enlisted the help of local Edinburgh solar specialists Solar Kingdom to aid evaluation and planning to optimise the integrated use of the technologies. Solar Kingdom were further involved with the installation and commissioning. 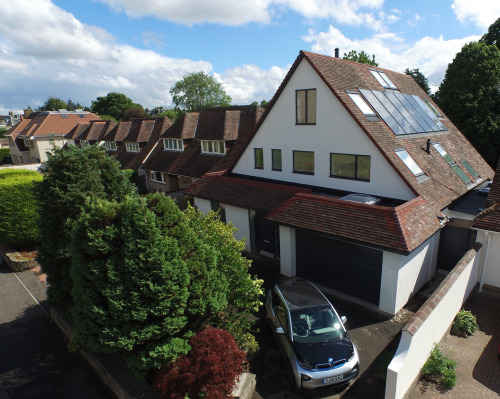 The Edinburgh home includes extensive insulation, triple glazed windows and doors, a whole house heat recovery system, LED lighting, solar PV and solar thermal panels integrated into the roof covering and a renewable heating system. After Rob Goodburn and his family have spent a period of time at the house, a study is to be carried out with a local university and the Building Research Establishment (BRE) in order to assess the building’s performance.